Grooving roads or airport taxiways requires precision work; the team at Diamond Products Ltd. Heavy Equipment Division, headquartered in Nampa, Idaho, built the PC1504 pavement grinder & groover to take care of that. Here’s how it works. 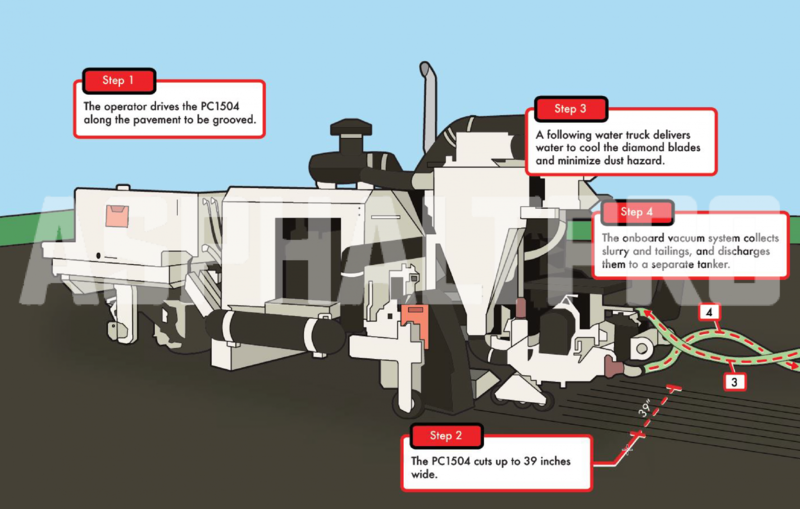 The PC1504 has an adjustable front bogey assembly which allows for an effective wheelbase of 9’ to 11’ from center of the cutting head to center of front bogey. The wheel base can be adjusted for various grinding or grooving applications. The operator drives the diesel-powered PC1504 along the section of road to be grooved at a production rate of 0 to 30 feet per minute. Twelve-inch-diameter blades for grinding or grooving can be stacked up to a 39-inch cutting width. Depth control wheels for grinding are adjustable via hydraulically controlled screw jacks. Manually adjusted grooving depth control wheels are attached to the mainframe directly in line with the blade-shaft centerline for accurate groove depth control. Power from the Caterpillar® 260-horsepower engine is transmitted through a manually operated PTO clutch to a right angle drive gearbox, which drives a single poly-chain GT carbon belt. The blade shaft turns at 1,400 to 1,900 revolutions per minute. A water truck follows in close proximity, delivering cooling for the diamond blades while minimizing any dust hazards. The onboard vacuum system, with diaphragm slurry pump, collects the slurry and grinding tailings, and discharges them to a separate collection tanker or other collection resource. The encoder unit incorporated into the ground drive control measures total daily footage ground and has a reset-able daily production odometer. Additionally, the encoder provides a feet-per-minute indicator for the operator. For more information, contact Customer Service at (800) 321-5336 or visit http://www.diamondproducts.com. If you’re an original equipment manufacturer with a complex product, let us help you explain its inner workings to asphalt professionals. There’s no charge for this news department, but our editorial staff reserves the right to decide what equipment fits the parameters of a HHIW feature. Contact our editor at sandy@theasphaltpro.com.